My father is hands down one of the best cooks ever! His creative dishes are always an event and menu planning could go on for weeks! One sure thing is that all the planning, creating, and time preparing makes every dish better than the next! My father never follows a recipe but truly creates works of art! True masterpieces! We all have our favorite dishes and it’s hard to narrow down the best of the best! From Ribs to Sesame Noodles, Beef Wellington to Grilled Veggies. Nothing is ever mediocre. A true chef! So while I was shopping yesterday I came across some Beef Short Ribs. They were beautiful. Never have I ever used the word beautiful to describe beef but they were! Fresh, grass fed, short ribs were in my hand and I was excited to make them! I can’t say I’ve ever made short ribs before but I knew just who to call! My Dad! I followed his recipe and of course, they were amazing! He walked me through how to made them & even called after dinner to see how they came out! Hope you enjoy them! or cook in the oven covered on 350 degrees for 3 hours then uncover for 20 minutes. 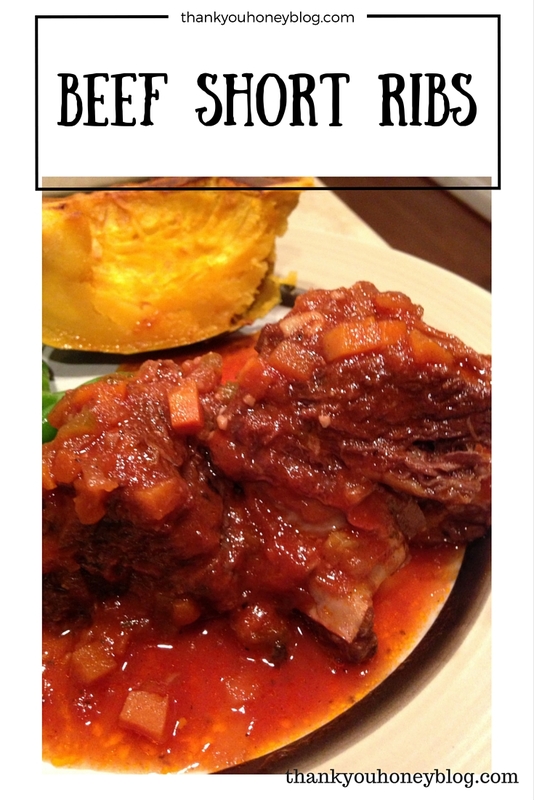 Serve with steamed green & roasted acorn squash. © Copyright 2016 Thank You Honey, thankyouhoneyblog.com. All Rights Reserved. Please seek permission before using original text or images. Follow our boards on Pinterest for more ideas! These sound delicious! Making me hungry. This looks so easy!!! YUM! Thanks for stopping by! I’m sure your guy friends will love! Serve it with some good bread because the sauce is awesome for dunking! Enjoy! I am glad I found this in case we ever get short ribs! Thanks for linking up with Creative K Kids’ Tasty Tuesdays. I’ve pinned it to the Creative K Kid’s Tasty Tuesdays Pinterest Board. Thank you for stopping by! I’m sure you will love them! These look so good. Do you think it would work with elk meat? Pinned and am featuring at Family Fun Friday. Thanks Monica! I’m sure it will be fabulous with elk. Thanks for featuring this recipe! Isn’t it so fun when dad cooks?My dad has gotten really adventurous in the kitchen as well and normally comes up with delicious ideas. Thanks for sharing on the weekend re-Treat link party! Mmmmm, you’re making my mouth water! Nothing like cookin’ low and slow…. 😉 Thanks for linking up with Let’s Get Real!